I had no idea when I made the first few pairs of these socks that they would be so loved. I have had so many awesome comments about them and a few people have ordered a couple of pairs. I'm so thrilled that they are so well loved. I know that I really like them. 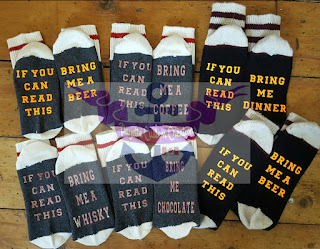 I've made myself a "beer" pair and a "whisky" pair... It's okay, I'm Canadian I am allowed to spell it without the "e". Although, for a split second I thought I made a mistake. A lot of the spelling that I use is "the American way" which I'm sure those who've followed my blogs over the past 6-7 years have noticed that. Ooops. Some people are so creative with what they want their feet to say "DINNER", "COFFEE", "CHOCOLATE", one lady even asked it to say "WATER" now there's dedication. My daughter wants a pair that says "bring me a taco". Me, I'll stick to my whisky. 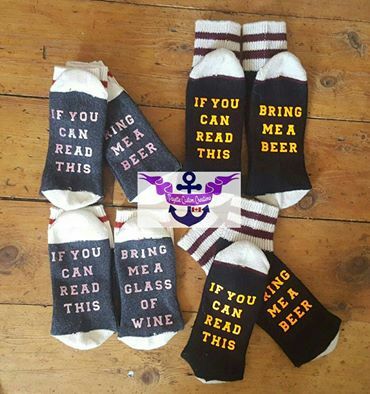 What would you want your socks to say? Please leave a comment below letting me know. Of course "beer" and "wine" are what started this whole thing so I'm curious, would you ask for either of those or something different? Don't be shy, please, share your thoughts!!! If you're interested in ordering either the "Bring me a drink" or "Bring me food" socks please click on their names and follow the link to the website. We would be happy to fill an order for you.